Kickstarter Campaign for Documentary Film Entitled "Nickel City Smiler" Looks to "Give Refugees a Voice"
CEP Films, LLC announces their Kickstarter Campaign "Nickel City Smiler: Give Refugees a Voice". Refugees come to America to seek refuge from governments that support inhumane conditions, “It is time to give refugees the voice they deserve”, says Scott Murchie, Director of Nickel City Smiler. The campaign has less than 40 days to meet our goal. A Karen refugee family from Burma in Buffalo, NY. “It is time to give refugees the voice they deserve”, says Scott Murchie, Director of Nickel City Smiler. The documentary film Nickel City Smiler tells the story of refugees determined to make a better life for themselves and their families. Our goal is to screen the film in places around the world where refugees are resettled and in the camps where refugees wait for the chance to start over in a new country. Our hope is that individuals throughout the world will gain a new understanding of the challenges refugees face everyday and help aid in their determination for a better life. Nickel City Smiler will also educate refugees on what to expect once they arrive in America from the perspective of refugees currently living here. 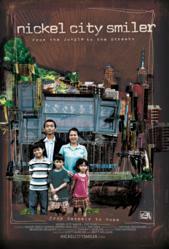 Nickel City Smiler chronicles an Asian American refugee’s fight for survival and hope. For his entire life, Smiler Greely has lived in conditions only few could imagine. Growing up in Burma, at age 10, Smiler and his family were forced to flee their small village after the Burmese military attacked, tortured, raped and murdered thousands of the countries ethnic minorities. As a teenager, Smiler was compelled to join the resistance army in an attempt to prevent the slaughter of innocent people at the hands of the Burmese Junta. Eventually, Smiler and his family escaped into Thailand where over the next 20 years they lived in various refugee camps enduring confinement and poverty. It was in Beh Klaw refugee camp, where Smiler met and married his wife Ma Dee and became a father. In 2007, an optimistic Smiler and his family were selected for resettlement by the United States and assigned to live in Buffalo, New York. Nickel City Smiler documents the ways in which Smiler’s resettlement in Buffalo, at times, is as challenging as the life he left behind. Smiler, his family and other refugees continue to battle hardship, violence and bureaucracy in one of America’s poorest cities. Smiler’s determination, optimism, and desire to support his community are manifested in his son Moe Joe’s moral idealism and sense of social justice. The strength present in Smiler’s family represents the very essence of the refugee community. Nickel City Smiler is a small voice for the refugees and delivers a simple message: The journey for many refugees never ends and hope and determination are the cornerstones of their character. This film will enlighten viewers and reveal the true nature of refugees and their challenges. To view a trailer and/or to learn more, please visit: http://www.kickstarter.com/projects/cepfilms/nickel-city-smiler-give-refugees-a-voice to support our campaign and visit our website at http://www.nickelcitysmiler.com. For additional information, please contact: Tom Haywood at 716-565-0541 or at tomh(at)cepfilms(dot)com.